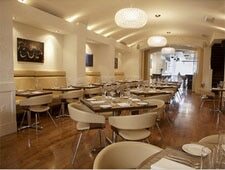 Sustainable seafood served in a stylish atmosphere. : The straightforward menu at this Georgetown restaurant offers fresh, well-prepared and sustainable fish and seasonal vegetables. The kitchen takes an artful approach to both texture and flavor combinations, and a don't-miss offering are the delicate fried oysters, if these should be available. Beefeaters might find grass-fed rib-eye, but remember, the menu is primarily seafood-centric. Pastry chef Heather Chittum served a stint in the kitchen of Michel Richard Citronelle, where she refined her chocolate skills. Her appreciation of fruits is evident in her thin pineapple slices and the appearance of apples and pears in her repertoire. The restaurant’s atmosphere delivers youthful exuberance with a sense of style, and the staff is helpful if one encounters an unfamiliar species or two.